Long Beach Unified School District Board of Education Member Megan Kerr joined State Assemblymember Patrick O’Donnell, other education leaders and students in Sacramento last week for a news conference in support of Assembly Bill 751, the Pathways to College Act. The bill would open doors to higher education for students by allowing school districts to offer college admissions tests such as the SAT or ACT during the school day at no cost to students. These tests could be given instead of the state-required assessment in 11th grade. O’Donnell (D – Long Beach), recently reintroduced the legislation, which passed through the State Legislature last year without any “no” votes but ultimately was not signed by then Gov. Jerry Brown. O’Donnell said the legislation would help to ensure that all students have access to test preparation and that the test is administered in a secure environment. “AB 751 removes obstacles to college attendance for students who may not otherwise have access to the exam or take it on their own,” O’Donnell said. Board Member Kerr said that by providing local control, AB 751 allows educators to offer college assessment and career resources, better preparing students for college as early as eighth grade. “The Pathways to College Act opens doors for all students to have college and career choices by making college admissions testing more accessible and affordable,” Kerr said. The news conference occurred on the same day the bill was scheduled to be heard by the Assembly Education Committee. O’Donnell chairs that committee and is a classroom teacher. AB 751 is a reintroduction of last year’s AB 1951, which moved through the State Legislature with strong support from school districts, school boards and students throughout the state. The bill was supported by about 150 school district superintendents. 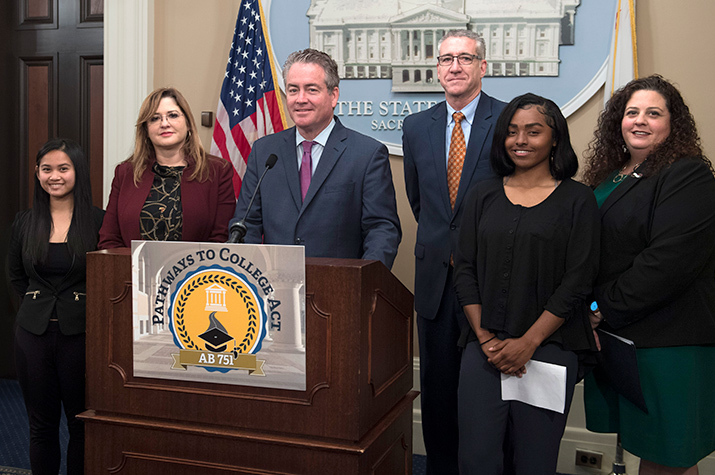 COLLEGE PATHWAY – Board of Education Member Megan Kerr, right, participated in a Sacramento news conference with Assemblymember Patrick O'Donnell, other education leaders and students.